Family members play an important role in helping older generations manage their affairs, maintain their health and avoid financial traps. Many families can tell stories of an aging parent who begins to show signs of cognitive or physical decline, and the work they did to prevent a major financial issue. While the need to help parents as they age is very common, it can also present challenges. Understanding the various stages of this progression and taking some key steps in each stage can help you more effectively navigate these challenging waters. Do they want to stay in their current home, or move into a condo or senior apartment at some point? If/when they need additional help, is it their preference to stay in their home, move in with family, or find assisted living or nursing care? Do they have long-term care insurance or other assets that might be tapped for future care needs? How have they managed their investments and how do they see this evolving in the years to come? Do they have medical directives in place and if so, what are they? Some may be surprised to find that their parents have specific plans in mind or have purchased long-term care insurance. For others who may be late to the planning process, opening the lines of communication may give them the nudge they need to plan for the future. Importantly, it can eliminate surprises and bring to light differences of opinion early on. A case in point: It is not uncommon for parents and their adult children to have conflicting views about financial support. A recent Fidelity Investments Survey1 found that 93% of parents found it unacceptable to become financially dependent on their children, while only 30% of children shared that view. The same survey found that nearly a fourth of adult children are planning to support their parents financially at some point. When the time is right, families will want to work toward a better understanding of their parents’ complete financial picture. A good place to start is by encouraging parents to complete a comprehensive financial inventory using a tool like Baird’s Personal Information Guide2. This process can be invaluable in capturing all the elements of their financial lives – including their investment accounts, mortgages or other debt, insurance policies and other personal assets – all in one place. It’s also important to gather specific information such as account numbers and online passwords. This is also a good time to identify and if possible, meet the financial professionals who are advising parents. 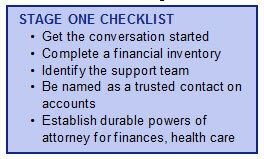 This may include a financial advisor, an attorney or estate planner, a banker and/or an accountant. With the parents’ permission, their financial advisor can set up family members to receive copies of account statements or trade confirmations when that becomes necessary. New rules enacted in 2018 require investment firms to obtain the name and contact information of a trusted contact person for each account. This trusted contact is someone firms can reach out to when there is concern over financial exploitation. As firms begin asking for this information, it can be a perfect opportunity for family members to begin to broach some of these issues with parents. At this stage, executing a durable power of attorney for both finances and health care, as well as naming an executor for their estates, should be done to ensure a smooth transition of responsibilities. It’s also a good idea to have parents sign a form complying with HIPAA (Health Insurance Portability and Authorization Act), which is needed to authorize the release of their medical records. If they haven’t already done so, encourage parents to establish transfer on death registrations on their accounts, which will allow them to maintain control of assets while living while easing the transfer to named beneficiaries later. Those wanting to maintain additional control over assets after their death may decide that a trust is more appropriate. For parents who wish to manage their finances independently for the time being, be sure to check in at least annually. Use the Personal Information Guide to see if anything has changed and to make sure they are continuing to manage their affairs appropriately. Cognitive and physical decline can be gradual, but watch for signs that parents may need more help. For some, the first sign might be a parent who falls victim to a fraud. Other warning signs might include large purchases that seem impulsive or inappropriate, bounced checks, a big loss on an inappropriate investment, or calls from credit collectors. A medical condition or fall that reduces a parent’s mobility can also make it difficult for them to continue to live independently. According to a Harris Poll conducted on behalf of the National Endowment for Financial Education3, 20% of adults say they have witnessed diminished financial capacity by an aging parent. Once it’s apparent that family members need to step in to provide additional assistance, it may be helpful to have conversations with people who have been through this with their own parents. A big question at this phase is the parents’ ability to stay in their house. If aging parents want to stay in their home, they’ll want to understand the costs associated with staying there. Will they need access to rooms upstairs? Will the house need to be retrofitted in any way with a walk-in shower or a wheelchair ramp? How expensive will those changes be and how will it affect the home’s resale value? Whether parents will stay in their home, downsize to a condo or apartment, or move into an assisted living or other facility, family members will want to identify who will be responsible for helping them in their diminished capacity. Siblings should talk about the roles each might be able to play as their parents’ needs change. It’s not uncommon for one sibling to manage the finances while others take responsibility for oversight of health care appointments or home maintenance. Hiring a professional caregiver can help, especially if there is only one child, or if children do not live close. More companies are offering services to help support aging adults in their home, but many of these organizations are very new with little formal licensing or oversight. It’s important to do due diligence and be very careful before sharing information about a parent’s finances. Now is also the time to help parents start to simplify their financial lives. This might include consolidating accounts across different financial institutions; cancelling credit cards, data plans, subscriptions and memberships they may no longer be using; and dropping car insurance if they are no longer driving. You will want to take a close look at credit card statements to make sure any recurring monthly or quarterly expenses aren’t being missed. A tax return also can be a good road map to double check what accounts they have. Lastly, verify their investment strategy is still appropriate given their circumstances and discuss changes that may need to be made. With life expectancies expanding, it is not uncommon to see parents living well into their 80s or 90s, although many of them will not be able to live independently. If a parent is truly incapacitated, families may need to seek guardianship to handle all of their financial affairs. This can be hard especially if the parent does not acknowledge that they need the help. Obtaining guardianship requires a court proceeding and must be granted by a judge, so it can be a difficult process. Another challenge can be when the more financially astute spouse begins to fail and the other spouse is not aware of the finances or is unwilling to acknowledge their partner’s decline. A common mistake made at this point is to add an adult child on as a co-owner on an account. This can create two problems. 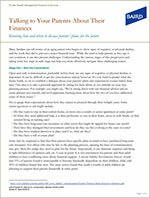 If the child encounters financial problems, creditors can come after the parents’ account. Or if the child has other motives, they can start tapping the account or could spend down assets that should be split among siblings after death and before the estate is settled. As health declines, some may be faced with a parent who cannot afford the necessary care and must rely on their children. In that case, siblings may need to further step up to provide financial help or even physical care. 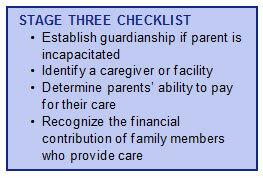 It is important to recognize the physical and emotional cost to a child who takes on the role of caregiver. If providing care interferes with work, the financial burden can be significant. 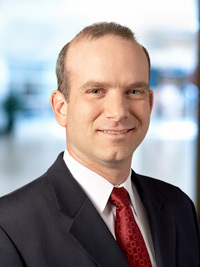 Adjusting for that contribution can be done in the estate planning process by allocating a greater share of remaining assets to the caregiver.